32-year old Israa Jaabis has been languishing in an Israeli prison for nearly 2 and a half years, carrying out an 11 year sentence for, according to the Israeli Military Court, attempting to carry out an attack on Israeli soldiers. Jaabis was driving in her car, roughly 500 meters from an Israeli military checkpoint when the car broke down. 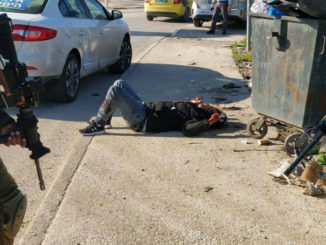 Israeli soldiers began shooting at the car and the bullets penetrated a canister of cooking fuel, causing it to explode. The car was set ablaze with Israa inside. 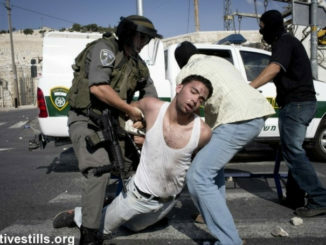 Israa was pulled from the car and arrested for attempted murder, treated very briefly in hospital and put in prison. Her health condition is declining, due to lack of treatment for severe burns on more than half of her body. Reporting for the Palestine Chronicle, Fayhaa Shalash spoke with Jaabis’ sister, Mona to learn more about her health, well-being and her family’s hopes for her release. Q: How is Israa getting along in prison? 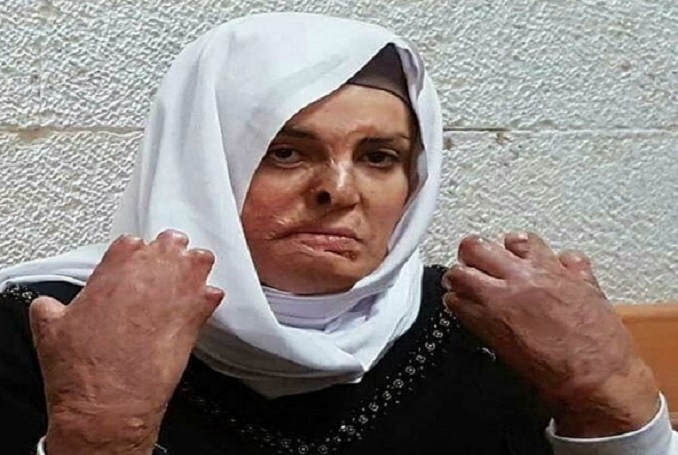 “Israa suffers from burns on 65 percent of her body, some burns being third degree. Eight of her fingers have been amputated as a result of these burns, and the rest of her fingers are severely damaged. She has lost most of the sight in her right eye. She also has a problem in her ears, which became fused to the sides of her head. “She is unable to more her head from side to side or up and down, and she has difficulty eating because she has a hard time chewing on her own due to the disfigurement that resulted from her burns. She always suffers from a high temperature and needs to wear light clothing even in winter to reduce her high temperature. She also bathes in cold water even in winter. “She has developed cracks on much of her skin and these cracks bleed continuously. She can’t breathe from her nose; she only does so through the mouth. “She also endures psychological distress, which manifests itself in terrible nightmares. She was transferred to prison following her arrest before finishing her treatment was complete at hospital, which lasted for three months and ten days. This is a very short period for someone in her situation. 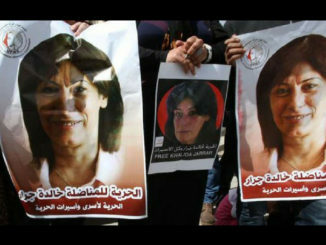 She was imprisoned as a regular prisoner without taking into account her health situation. Q: Who visits Israa from her family and how is her morale during visits? “My two sisters and I visit as often as we can but the prison often arbitrarily bars us from seeing her. Her son Mutasim visited her once after he was forbidden to visit for a period of 16 months. He tried once more last month to visit but the prison refused to allow him to see his mother. “When he was allowed to see her for the first time, I was with him. It was too difficult for our mother to cope with seeing her. “Mutasim’s silent reactions sometimes can’t be translated into words. When the visit finished, he asked me, ‘My mother is beautiful, true?’ Of course, she is beautiful now, but she was more beautiful. “As for her emotional well-being, sometimes she feels broken and she complains about pain and tries to hide the pain and ask about our news, but we know that Israa’s worst pain is inside her. Q: How did you receive the news of her arrest and injury? “The news was devastating for everyone. Before the night before the incident, I dreamed of a burnt woman and woke up to a nightmare. The day she was injured and burned, my brother came to me and showed me a picture posted by the Israeli army on social media He asked me. ‘Is this Israa’s car?’ I told him never, but I knew it was hers. “She was driving her car when it exploded near a police checkpoint. All the signs indicated that the vehicle was broken down. But the army fired at the vehicle which made it explode. By doing so, the occupation forces destroyed Israa’s body. “We are used to suffering. The army demolished our family home in 1998. After Israa’s accident and imprisonment, they demolished our house again. Q: What is your situation at home especially after Israa’s story has gone viral recently? “My mother is having a very difficult time. My father weeps like a child. I have tried to show that I am a source of strength. But inside, I feel a burn more than Israa. I spend my time alone crying. My mother is a very strong woman. But lately her grief has incapacitated her. She will cry and wail for Israa until she collapses. “She avoids appearing in front of cameras so as not to show her tears. We are very much touched because Israa was full of love and life and fun. She brought joy to our house. She was more than a sister, she was a great friend. “We used to talk a lot and we would share our worries. She was my only friend. I didn’t have any other friend. Those who knew Israa knew how she was a kind-hearted and helpful to everyone without expecting any reward for her kindness. “Our little sister, Batoul, is very affected by what happened to Israa and she cries all the time. She recalls many of her memories and she mixes tears with laughter. I am from Vancouver,Canada and I wanted to say that several decades ago a young woman from Chile was severely burned by a soldier in that country who threw gasoline on her and set her on fire.She came to Montreal,Canada to be treated for severe burns and it became known worldwide.There is no such publicity or treatment for Israa Jaabis. The western Gov’ts sides with the Apartheid Israeli Gov’t and don’t care less about what happens to the Palestinian People.The western Gov’ts have been condemned for this throughout the world.The majority of people in the world supports the Palestinian People in their fight against the Apartheid Israeli Gov’t and that support will continue.